Making homemade sausage is easy, as long as you have the right equipment in your kitchen. With this, if you are clueless about which one to pick, learn from our sausage stuffer reviews. We have picked five top products in the market and in the end, we will recommend the best choice. Electric or Manual Sausage Stuffer? These are manual stuffers. This means you have no option but to operate them by hand. This is going to be labor-intensive. Cast iron and stainless steel are the materials commonly used. With a capacity generally ranging from three to five pounds, this is a perfect choice for beginners. From the three types, this is by far the most popular. It is well-loved by both starters and experts in the kitchen. They are available either as manual or electric models. 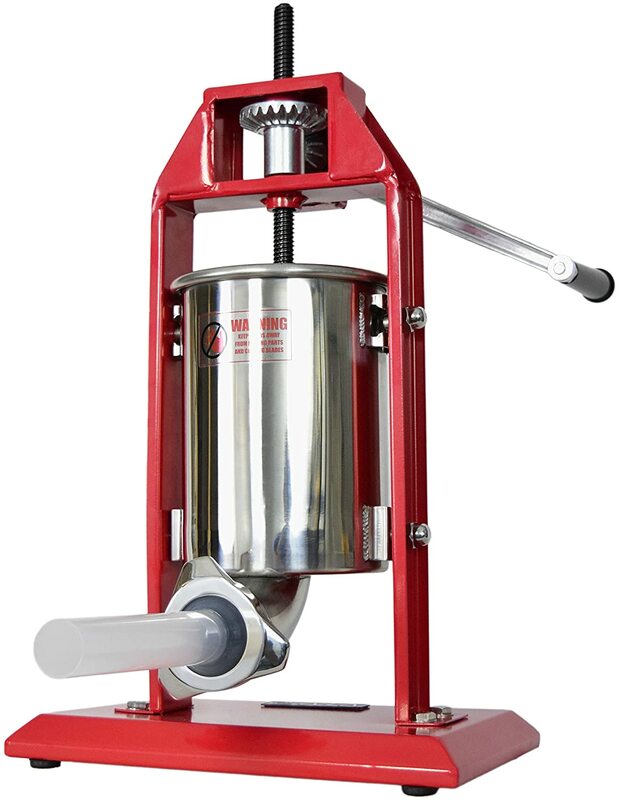 There is a piston cylinder to grind meat, while the one used for stuffing is positioned vertically. Generally, the capacity is anywhere from five to 15 pounds. 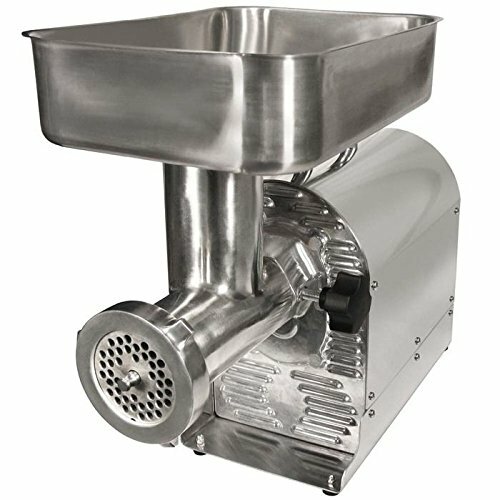 Manual Sausage Stuffer: This is the perfect choice for stuffing small batches, such as for those who do it casually. Since they will require a lot of effort on your end, its use can be exhausting. It is simple and user-friendly, making it ideal for beginners. Here are some of the most important factors to take into consideration as you try to narrow down the possibilities. This is one of the first things that should be given careful thought. Especially for beginners, make sure it has basic functionality. The manufacturer must provide careful instructions on how to operate the machine. All controls should be strategically positioned. If you are a novice, narrow down the possibilities by picking lower-end models with simple features. If the sausage stuffer is to be used casually and only for sausage you intend to consume at home, a small one is enough. On the other hand, if for business, invest in a machine with a larger capacity. The higher the capacity is, the bigger the stuffer you should purchase.. It also means more space is required in the kitchen.. In line with this, you should also check the capacity of the cylinder. It will be indicative of the amount of meat transferred in the case in one stuffing. Like other kitchen appliances, for sure, you do not want one that wears down only after a short span of use. With this, choose a model made from premium materials, guaranteeing it will be useful even for many years. Having a steel base and metal components is good since this will be able to withstand long-term use. Plastic can be cheap, but the problem is it does not last long. If you are concerned about your safety, choose a product made by a trusted manufacturer to lessen the likelihood it will be a risk in any way. It should also have the necessary certification, making sure it passes stringent quality tests. A certification from IEC System of Conformity Assessment Schemes for Electrotechnical Equipment and Components is also a good indication of safety. It must have the ability to detect whether it grinds meat or your finger! The least you would want is to end up with a bloody accident in the kitchen. 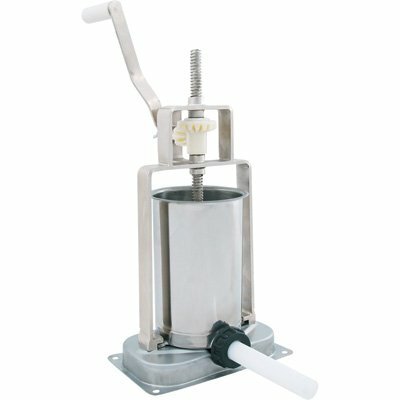 If you want to have peace of mind, make sure the manufacturer offers extensive warranty for their sausage stuffer. Most of the models in the market have one year warranty. It would be better if there is a longer period for warranty. Within such duration, if there is any problem experienced, the manufacturer can offer a free repair. To be eligible for warranty, however, see to it that the terms and conditions are met. In your search for the best within the product category, this is one model I can personally recommend, especially if you are after durability. While the piston handle is made from plastic, it comes with metal and stainless steel components. They are known for their incredible strength, even after years of use. The stainless steel base is one more thing I love. This makes sure the unit will stay in a steady position, regardless if it is used in its full capacity. Being corrosion-resistant is another great thing. It is also indicative of durability. Another feature you might appreciate from this product is the pressure relief valve. 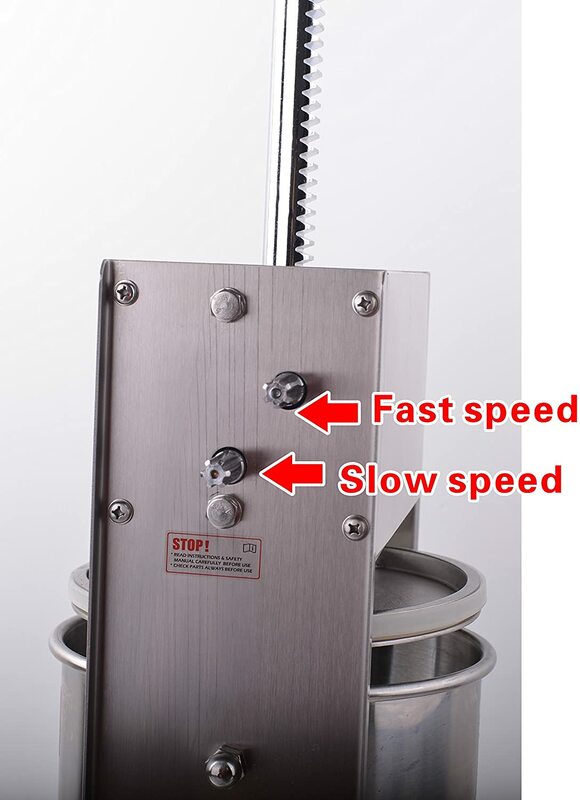 This allows you to have the better ability to regulate the pressure when the case of the sausage is stuffed, this provides users with better control of the machine. Lastly, it also comes with a removable cylinder. This will make filling and stuffing a snap for you to accomplish. This is another product I can highly recommend, especially for pros who are looking for a high-capacity option. This is perfect for easily making large batches of homemade sausages. The stainless steel components are another good reason to have it chosen above others. This material may be heavy, but the good thing is it is long-lasting. You can be assured of its ability to retain its premium quality even through the years. In terms of versatility, this can also be a great choice. There are four stuffing tubes. They are available in different sizes. This provides you the freedom to choose the one to be used depending on the size of the sausage you intend to make. It should also be noted it has all-metal gears, indicative of its superior quality. It also has resin bevel gears, making it almost effortless on your end to crank the piston. If durability is an important concern, this is another product you might want to consider. One of the reasons for this is its stainless steel cylinder. To add, it also comes with piston and gears made from metal, making them withstand long-term use. One of the unique features worth noting about this model is the tilting back of the unit. This makes filling a lot less complicated. You do not need to start filling from the top as it can be tilted to a more convenient angle. It also has an air release valve. It is another feature making it deserving to be included in this list. The piston is made from aluminum, releasing air based on the pressure applied to the valve. The rubber gasket surrounding the valve is also impressive. It will avoid penetration of sausage. When it comes to cleaning, you do not have to waste a lot of effort. All parts are effortless to maintain, especially because you can tilt the cylinder. While there are many things to love about this model, one I would like to highlight is it is long-lasting. This is because it comes with stainless steel housing, making it functional even after a long time. It is also a good thing there are pre-drilled holes on the bottom of the unit. This makes it effortless to screw the unit and to make it stable, regardless of how intense it operates. The piston is made from plastic. A lot of people may not like this because the quality may be inferior. However, it is impressive since this is food-grade and hence, it guarantees your safety. The large capacity of the stuffer is one great thing, but this is even made better by the fact that it comes with a compact design. Even if you have a small kitchen, this model is going to be well-loved as it does not consume too much space. If you are not concerned about budget, this is one product you might love. Do not be instantly discouraged with its steep price. This sausage stuffer is expensive, but only because of its abundance of features. This is a good choice for the pros who are unwilling to settle for anything less. One thing I love about this model is ease of assembly. This is one reason cleaning is effortless. It is also a good thing it can be easily taken down when there is a need to keep in the cabinet. The air-cooled motor is another reason why this makes a great choice. Complemented with a circuit breaker, you can be confident you will stay safe. Another benefit of this is it lessens the noise produced as the machine works. Lastly, this sausage stuffer is known for its versatility. This is because aside from being a sausage stuffer, it also functions as a grinder. You can grind meat from the unit itself, instead of buying a separate machine to do the job. From the short sausage stuffer reviews above, it is difficult to find only one product that is best for all users. 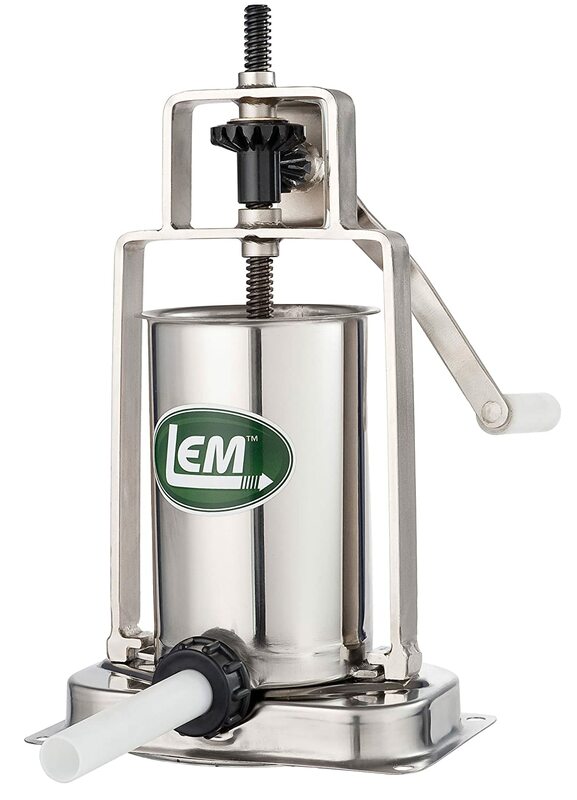 If there is a single model I can personally suggest, it would be LEM Products 5-pound Stainless Steel Vertical Sausage Stuffer. Its capacity might be smaller than many other alternatives, but its quality is impressive. From its construction to its functionality, you can be confident this is going to deliver performance beyond comparison. Whether you are a novice or a pro in the kitchen, this sausage stuffer can make your life easier in more ways than one. Really nice and informative article! I want to get the same sausage stuffer that you are using! Thanks again! Wow, this is really informative, I did some research and I guess the LEM is the best one.